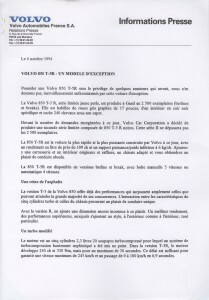 Volvo Automobiles France S.A. release a press message about the launch of the second series T-5R. After the first 2500 T-5R’s in yellow, Volvo decided to extend the serie with 2500 black T-5R’s. Though they already had produced black cars in the pre series, as with the two white ones, only short before productionstart the black ones got green light too. 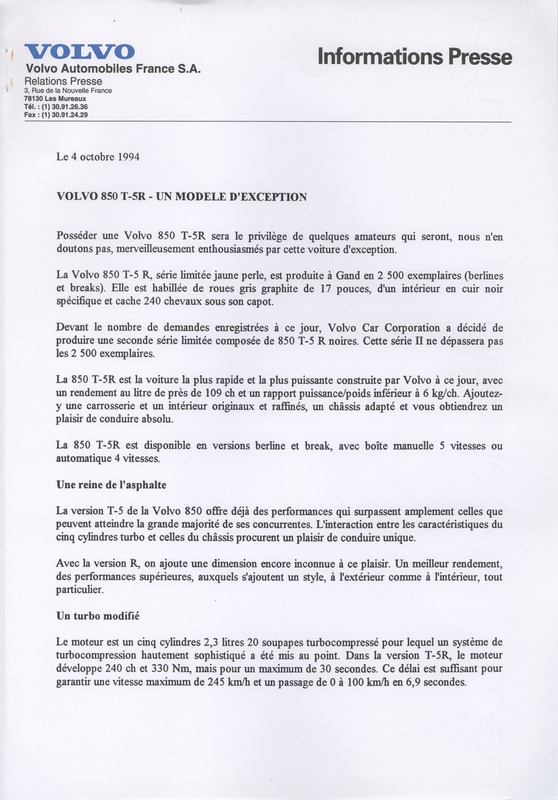 Funny that Volvo France added black and white pressfoto’s from a car whose colors made the difference. doubt, be wonderfully excited about this exceptional car. 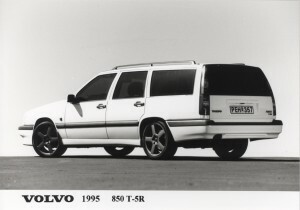 The Volvo 850 T-5 R, a yellow pearl limited edition, is produced in Ghent at 2500 units (sedans and wagons). It is fitted with graphite gray colored, 17-inch wheels, a specific black leather interior, and hides 240hp under its hood. Given the number of applications received to date, Volvo Car Corporation has decided to produce a second limited edition consists of 850 T-5 R black. This series II will not exceed 2500 units. 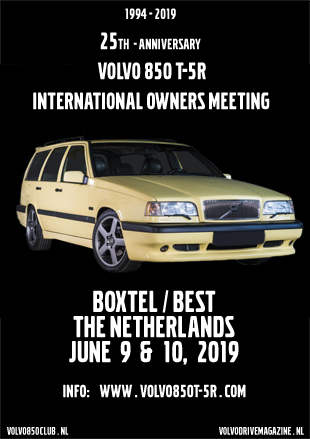 The 850 T-5R is the fastest and most powerful car built by Volvo to date, with a yield of nearly 109hp per liter and a power / weight ratio of less than 6kg/hp. Combined with exclusive and refined body and interior characteristics and a customized chassis, it will give you an absolute pleasure to drive. 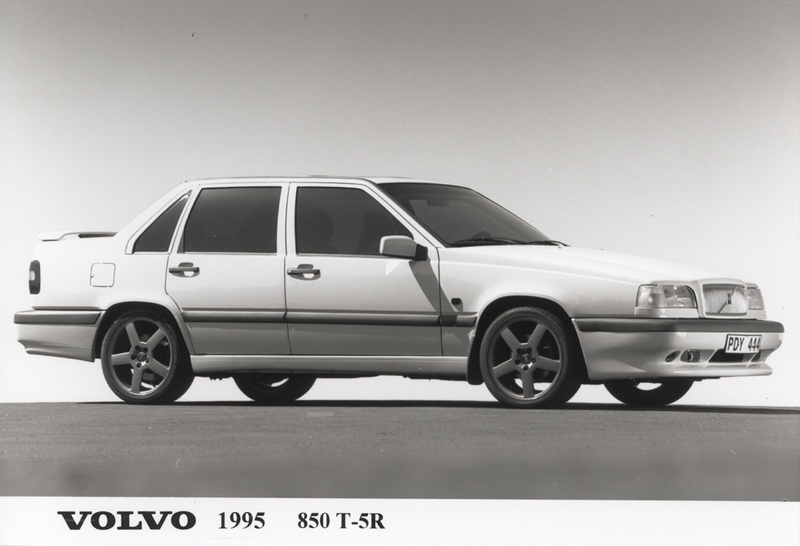 The 850 T-5R is available in sedan and station wagon versions, with 5-speed manual or 4-speed automatic transmissions. The T-5 version of the Volvo 850 already offers performances largely surpassing those reached by the vast majority of its competitors. The interaction between the characteristics of the five-cylinder turbo engine and chassis provide a unique driving pleasure. With the R version, we add an yet unknown dimension to this pleasure. Better output, superior performances, combined to an exclusive styling, both on the outside and on the inside. The engine is a turbocharged 2.3-liter 20-valve five cylinder, for which a highly sophisticated turbocharging system has been developed. 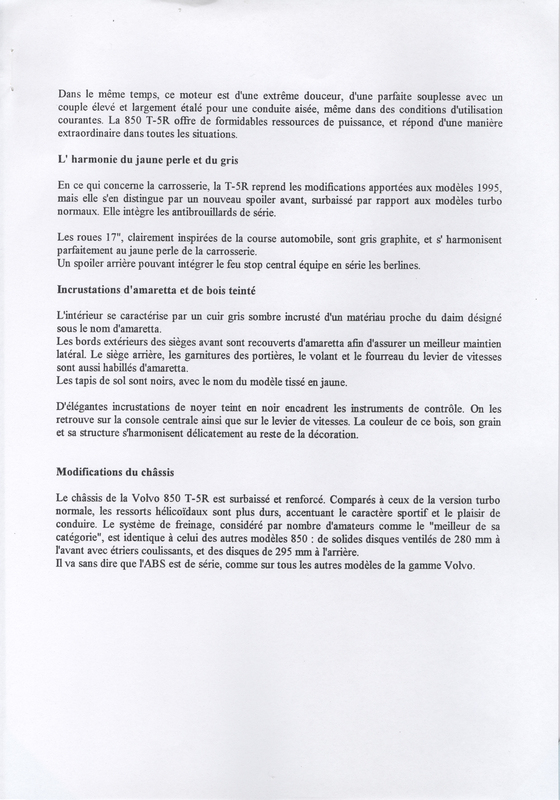 In the T-5R version, the engine develops 240hp and 330Nm, but only for a maximum of 30 seconds. 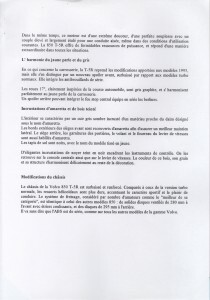 This period is sufficient to guarantee a maximum speed of 245 km/h and a 0-100 km/h acceleration in 6.9 seconds. At the same time, this engine is extremely smooth, combining perfect flexibility with high torque widely spread for easy driving, even under conditions of common use. The 850 T-5R offers tremendous power resources, and responds in an extraordinary way to all situations. Regarding the body, the T-5R includes all modifications for the 1995 model year, distinguishing itself further by a new front spoiler, lowered compared to normal turbo models. Integrated fog lights come standard. The 17” wheels, clearly inspired by racing, are coated in graphite gray tone and perfectly harmonize with the yellow pearl body. A rear spoiler able to integrate the central braking light is fitted as standard on saloons. The interior is characterized by a dark gray leather upholstery inlaid with near suede material designated as Amaretta. The outer edges of the front seats are covered with Amaretta to provide better lateral support. The rear seat, door trims, steering wheel and the gear lever gaiter are also upholstered in Amaretta. The floor mats are black, with the name of the model woven in yellow. Elegant black stained walnut inlays frame the instrument clusters. These inlays can further be found on the center console, as well as on the gear lever. The color of the wood, its grain and structure delicately blend the rest of the decor. The Volvo 850 T-5R chassis is lowered and strengthened. Compared to the normal turbo model, its coil springs are harder, emphasizing the sporty character and driving pleasure. The braking system, considered by many fans as the “best in class”, is identical to that of the other 850 models: Solid 280 mm ventilated discs at the front with sliding calipers, and 295 mm discs at the rear. It goes without saying that the ABS is standard, as on all other models in the Volvo range.